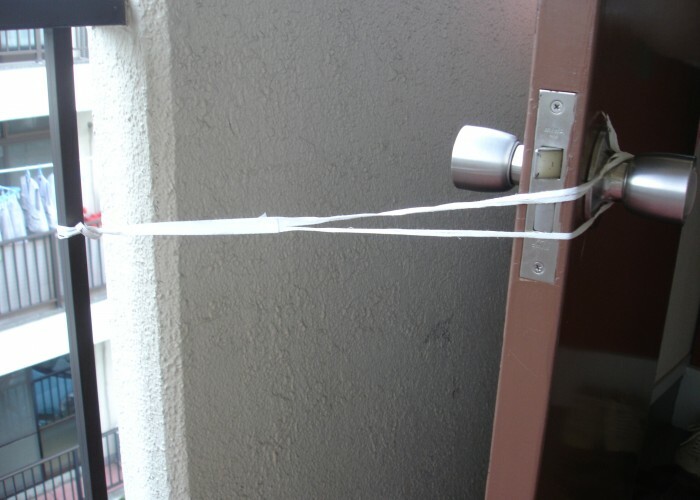 A packing strap tied to the railing and looped around the doorknob helps a tired and irritated mother with getting her groceries inside and enabling her muddy kids to undress before setting foot the cramped entrance. It also acts as a frugal cooling device in summer, allowing for cross ventilation from all four sides of this corner apartment. What other simple door-hacks can you find around your house, and what benefits other than access and ventilation might doors provide? What can architects and engineers learn from housewives, dirty kids and overheated retirees?